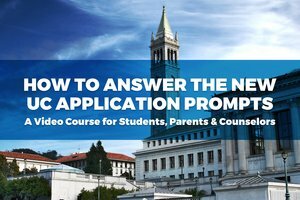 Usually on the podcast I interview the most brilliant minds in the college admissions world, to analyze their genius, and then break it down for you into a series of practical, actionable steps to help you in the college application process. Over the past ten years I’ve delivered hundreds of personal statement workshops--some as small as 4 and some as large as 800--and earlier this year I was getting a bunch of workshop requests and thinking: I can’t deliver all these--in large part because I like spending time with my wife and baby. But you know what I could do, I thought? Leverage one of students’ greatest resources--their counselor (and if you’re a counselor listening, that’s you)--and all they’d need in some cases is a few tools to help guide their students through the process. So I spent the past few months creating something called the Essay Workshop in a Box that basically walks counselors step-by-step through how to deliver a great workshop--and I found a way to do it that would bring no cost to their students. That’s right: free-ninety-nine. Bee tea dubs: These are essentially three of the modules from the Essay Workshop in a Box--there are 29 total, btw, and you can find out more about that in the show notes. At the end I also say a few words about my Counselor Training Program, which I’m super duper excited about. Thanks for listening to the podcast and, if you aren’t a counselor, don’t worry because the next episode--and all the others!--are for you. Please enjoy this episode… I hope it changes your life. Get nametags--skip the name sharing.